If you looking for BBQ Island or a full outdoor kitchen One of our signature items is our unique stucco finishes. These exciting, elegant stone and acrylic products are well known in architecture not only for their range of style and color, but for their durability as well. Our hand-trowled plaster/stone stuccos are three times stronger than the standard product most commonly used in the industry,. The variety of styles and ideas we offer is limitless, and the care and effort we put into our products is unmatched. Outdoorkitchens.info believes not only in creating a unique and beautiful product, but one that will truly pass the test of time. 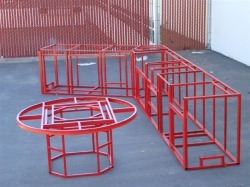 *Our island footings are constructed of 100% steel-welded tubing as are our countertops. *We use large hardy-backer boards (4’ by 8’ sheets) eliminating unnecessary seams. *Our islands rest on a series of water-proof slats, allowing water to pass underneath the footing without touching it.